The late Mr M.H.M'Kerrow was in its truest sense the father of this Society, both in the length of his membership and the part which he had played in our long history. 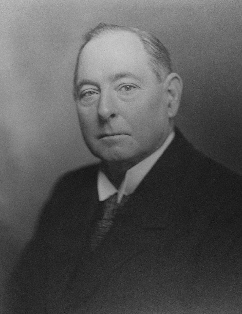 He became a member in 1900, just 53 years ago, and five years later he became Treasurer of the Society, laying down that office after 25 years service on his election as President in 1930. Apart from his Presidential Address, his name rarely figures as a contributor in our Transactions, but that gives no indication of the unobtrusive, loyal, and unceasing work which he did for the Society. When he took office he found our financial affairs in a deplorable state. The total income was £67. There were no reserves, for life membership fees had been used as income. The cupboard was bare. Within two years, nobly backed by a new President, Sir Hugh Gladstone, and a new Secretary, Mr Shirley, he showed an income of £176 and a reserve of £230. That reserve was really a replacement of life membership fees, and could only have come from the pockets of Sir Hugh Gladstone and of himself. From that moment the Society never looked back, and Mr M'Kerrow lived long enough to see that reserve reach almost, £800. When the first war broke out the Society agreed to suspend activities. Realising that this decision was tantamount to burial, Mr M'Kerrow called a meeting and urged me to come up from London. We got the decision reversed, but only on condition that the subscription be reduced to 2s 6d. Nevertheless we carried on and even continued publication in very depleted form. When the second war came he again was in the forefront for continuity. Our Past President has left behind him one permanent memorial — the Museum. In 1932 the Trustees were in difficulties and the Museum was in the market. Mr M'Kerrow stepped into the breach, and, after prolonged negotiations, arranged that the Town Council should buy the site and that the contents should be acquired partly by a grant of &ound;200 from the reserves of this Society and other sources, but mainly, I fancy, from Mr M'Kerrow's own resources. The Museum was purged of much of its contents and modernised, as you see it to-day, and very properly he became the chairman of its Committee. As such he made his last public appearance last July when the Scottish Regional Group visited Dumfries. He greeted them in the Museum at a reception given by the Town Council. Mr M'Kerrow rarely appeared in the limelight, which he shunned, but few have done more for this Society than himself.